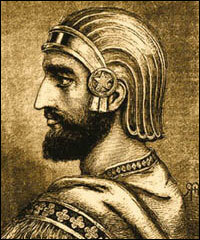 An old Iranian portrait of Cyrus the Great (artist's conception). 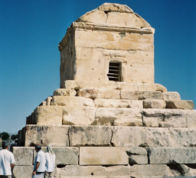 Cyrus the Great ( Old Persian: Kuruš, modern Persian: کوروش, Kourosh; ca. 576 or 590 BC — July 529 BC), also known as Cyrus II of Persia and Cyrus the Elder, was the founder of the Persian Empire under the Achaemenid dynasty. As leader of the Persian people in Anshan, he conquered the Medes and unified the two separate Iranian kingdoms; as the king of Persia, he reigned over the new empire from 559 BC until his death. The empire expanded under his rule, eventually conquering most of Southwest Asia and much of the Indian frontier to create the largest nation the world had yet seen. The name Cyrus is a Latin transliteration of the Greek Κῦρος. The ancient historians Ctesias and Plutarch noted that Cyrus was named from Kuros, the sun, a concept which has been interpreted as meaning "like the sun," by noting its relation to the Persian noun for sun, khorsheed, while using -vash as a suffix of likeness. However, some modern historians, such as Karl Hoffmann and Rüdiger Schmitt of the Encyclopædia Iranica, have suggested the translation "humiliator of the enemy in verbal contest." In modern Persian, Cyrus is referred to as Kourosh-e Bozorg — the Persian-derived name for Cyrus the Great. In the Bible, he is known as simply Koresh. A bas-relief found at Pasargadae shows a figure thought to be Cyrus, depicted with four Assyrian wings, and wearing a horned Egyptian-like crown and a Persian dress. Cyrus the Great was the son of the Persian king Cambyses I and a Mede princess from the Achaemenid dynasty, which ruled the kingdom of Anshan, in what is now southwestern Iran. The dynasty had been founded by Achaemenes (ca. 700 BC), who was succeeded by his son Teispes of Anshan. Inscriptions indicate that when the latter died, two of his sons shared the throne as Cyrus I of Anshan and Ariaramnes of Persia. They were succeeded by their respective sons Cambyses I of Anshan and Arsames of Persia. However, the authenticity of these inscriptions has been called into question, thus blurring the history of Cyrus' predecessors. According to Ctesias, Cyrus the Great married a daughter of Astyages, which seems unlikely, as his wife would also be his aunt. A possible explanation is that Astyages married again, and his second wife bore him this daughter. Cyrus' first wife, Cassandane, is equally obscure. According to Herodotus and the Behistun Inscription, she bore Cyrus at least two sons, Cambyses II and Smerdis. Both sons later separately ruled Persia for a short period of time. Cyrus also had several daughters, of which two would marry Darius the Great, Artystone and Atossa. The latter is significant, as she gave birth to of Xerxes I, Darius' successor. Cyrus was born in either 576 BC or 590 BC. Little is known of his early years, as the sources detailing that part of his life are few, and have been damaged or lost. Herodotus's story of Cyrus' early life belongs to a genre of legends in which abandoned children of noble birth, such as Oedipus and Romulus and Remus, return to claim their royal positions. His overlord was his own grandfather, Astyages, ruler of the powerful Median kingdom. After the birth of Cyrus, Astyages had a dream that his Magi interpreted as a sign that his grandson would eventually overthrow him. He then ordered his steward Harpagus to kill the infant. Harpagus, morally unable to kill a newborn, summoned a herdsman of the king named Mithridates and ordered him to dispose of the child. Luckily for the young boy, the herdsman took him in and raised him as his own. When Cyrus was ten years old, Herodotus claims that it was obvious that Cyrus was not a herdsman's son, stating that his behaviour was too noble. Astyages interviewed the boy and noticed that they resembled each other. Astyages ordered Harpagus to explain what he had done with the baby, and after confessing that he had not killed the boy, the king forced him to eat his own son. Astyages was more lenient with Cyrus, and allowed him to return to his biological parents, Cambyses and Mandane. While Herodotus' description may be a legend, it does give insight into the figures surrounding Cyrus the Great's early life. The exact dates of the Lydian conquest are unknown, but it is generally suggested to have begun in 547 BC. The Lydians first attacked the Achaemenid Empire's city of Pteria in Cappadocia. Croesus laid siege to the city, and captured its inhabitants as slaves. Meanwhile, The Persians invited the citizens of Ionia, who were part of the Lydian kingdom, to revolt against their ruler. The offer was rebuffed, and thus Cyrus levied an army and marched against the Lydians, increasing his numbers while passing through nations in his way. The Battle of Pteria was effectively a stalemate, with both sides suffering heavy casualties by nightfall. Croesus retreated to Sardis the following morning. While in Sardis, Croesus sent out requests for his allies to send aid to Lydia. However, near the end of winter, before the allies could unite, Cyrus pushed the war into Lydian territory and besieged Croesus in his capital, Sardis. Shortly before the final battle between the two rulers, Harpagus advised Cyrus to place his dromedaries in front of his warriors; the Lydian horses, not used to the dromedaries' smell, would be very afraid. The strategy worked; the Lydian cavalry was routed. Cyrus defeated and captured Croesus. Cyrus occupied the capital at Sardis, conquering the Lydian kingdom in 546 BC. According to Herodotus, Cyrus spared Croesus' life and kept him as an advisor, but this account conflicts with some translations of the contemporary Nabonidus Chronicle, which interpret that the king of Lydia was slain. Before returning to the capital, a Lydian named Pactyes was entrusted by Cyrus to send Croesus' treasury to Persia. However, soon after Cyrus' departure, Pactyes hired mercenaries and caused an uprising in Sardis, revolting against the Persian satrap of Lydia, Tabalus. With recommendations from Croesus that he should turn the minds of the Lydian people to luxury, Cyrus sent Mazares, one of his commanders, to subdue the insurrection, but demanded that Pactyas be returned alive. Upon Mazares' arrival, Pactyas fled to Ionia, where he had hired mercenaries. Mazares marched his troops into the Greek country and captured the cities of Magnesia and Priene, where Pactyas was captured and sent back to Persia for punishment. Mazares continued the conquest of Asia Minor, but died of unknown causes during his campaign in Ionia. Cyrus sent Harpagus to complete Mazares' conquest of Asia Minor. Harpagus captured Lycia, Cilicia and Phoenicia, using the technique of building earthworks to breach the walls of besieged cities, a method unknown to the Greeks. He ended his conquest of the area in 542 BC, and returned to Persia. Superimposed on modern borders, the Achaemenid Empire under Cyrus' rule extended approximately from Turkey, Israel, and Azerbaijan in the west to Kazakhstan, Kyrgyzstan, and Pakistan in the east. Persia became the largest empire the world had ever seen. In 539 BC, towards the end of September, Cyrus' armies, under the command of Gubaru, the governor of Gutium, attacked Opis on the Tigris river and defeated the Babylonians after a minor uprising. With Opis subjugated, the Persians took control of the vast canal system of Babylonia. On October 10, the city of Sippar was seized without a battle, with little to no resistance from the populace. It is probable that Cyrus engaged in negotiations with the Babylonian generals to obtain a compromise on their part and therefore avoid an armed confrontation. Nabonidus was staying in the city at the time, and soon fled to the capital, Babylon, which he had not visited in years. Two days later, on October 12, Gubaru's troops entered Babylon, again without any resistance from the Babylonian armies. Herodotus explains that to accomplish this feat, the Persians diverted the Euphrates river into a canal so that the water level dropped "to the height of the middle of a man's thigh," which allowed the invading forces to march directly through the river bed to enter at night. On October 29, Cyrus himself entered the city of Babylon and arrested Nabonidus. He then assumed the titles of "king of Babylon, king of Sumer and Akkad, king of the four sides of the world." Prior to Cyrus' invasion of Babylon, the Babylonian Empire had conquered many kingdoms. In addition to Babylonia itself, Cyrus incorporated its subnational entities into his Empire, including Syria and Palestine. According to the Behistun Inscription of Darius the Great, Cyrus' dominions must have comprised the largest empire the world had ever seen. At the end of Cyrus' rule, the Achaemenid Empire stretched from Asia Minor and Judah in the west to the Indus River in the east. Ctesias reports only that Cyrus met his death while warring against tribes north-east of the headwaters of the Tigris. In Herodotus' account, Cyrus met his fate in a fierce battle with the Massagetae, a tribe from the southern deserts of Kharesm and Kizilhoum in the southernmost portion of the steppe region, after ignoring advice from his advisor, Croesus, to not continue forward. The Massagetae were related to the Scythians in their dress and mode of living; they fought on horseback and on foot. The queen of the Massagetae, Tomyris, who had assumed control after Cyrus had defeated Tomyris' son Spargapises, led the attack. The Persian forces suffered heavy casualties, including Cyrus himself. After the battle, Tomyris ordered the body of Cyrus to be found, and then dipped his head in blood (or ordered his head to put into a wine-skin filled with human blood) to avenge the death of her son at his hands. "O man, whoever you are and wherever you come from, for I know you will come, I am Cyrus who won the Persians their empire. Do not therefore grudge me this little earth that covers my body." Cuneiform evidence from Babylon (letters dated to regnal years) prove that Cyrus was dead in December 530 BCE, and that his son Cambyses II was king. His younger son, Smerdis, died before Cambyses left to invade the eastern front. From Herodotus' account, Cambyses killed his brother to avoid a rebellion in his absence. Cambyses continued his father's policy of expansion, and managed to capture Egypt for the Empire, but soon died, after only seven years of rule. An imposter named Gaumata, claiming to be Smerdis, became the sole ruler of Persia for seven months, until he was killed by Darius the Great, the grandson of Arsames, who ruled Persia before Cyrus' rise. Cyrus the Great allowed the exiled Hebrew pilgrims to resettle and rebuild Jerusalem, earning him an honored place in Judaism. The only known example of his religious policy is his treatment of the Jews in Babylon. 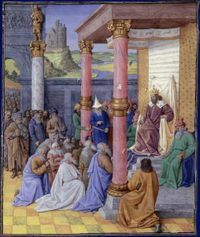 The Bible records that a remnant of the Jewish population returned to the Promised Land from Babylon, following an edict from Cyrus to rebuild the temple. This edict is fully reproduced in the Book of Ezra. 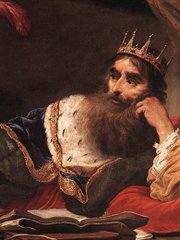 As a result of Cyrus' policies, the Jews honored him as a dignified and righteous king. He is the only Gentile to be designated as a messiah, a divinely-appointed king, in the Tanakh. During his reign, Cyrus maintained control over a vast region of kingdoms, but it is not clear how. The organizing of the empire into provinces called satrapies, ruled by provincial admnistrators, vassal kings called satraps, dates to the reign of Darius. Cyrus demanded only tribute and conscripts from many parts of the realm. Cyrus' conquests continued the process, started by the Assyrians and continued by the Babylonians, of empire building where a large superstate, comprising many dozens of countries, races, and languages, were ruled under a single administration headed by a central government. This system of satrapies lasted for centuries, and was retained both by the Greek Seleucid dynasty during their control of Iran and later by the Persian Parthians and Sassanids. The Cyropaedia of Xenophon, a novel about the Great King's life, forms a treatise on politics, much read through the Renaissance, and indeed through the eighteenth century. The book influenced Sir Thomas Browne, who named his hermetic 1658 discourse, entitled The Garden of Cyrus, after the ruler. With its abundant use of metaphors, Browne characterizes many ancients as "vegetables", with Cyrus as "the splendid and regular planter". I am an Iranian, a descendant of Cyrus the Great. This emperor proclaimed at the pinnacle of power 2,500 years ago that he 'would not reign over the people if they did not wish it.' He promised not to force any person to change his religion and faith and guaranteed freedom for all. The Charter of Cyrus the Great should be studied in the history of human rights. While the cylinder reflects a long tradition in Mesopotamia where, as early as the third millennium BC, kings such as Urukagina began their reigns with declarations of reforms, the Cyrus Cylinder has been referred to as the "first charter of human rights"; though such a concept would have been alien to Cyrus and his contemporaries. The cylinder decrees the normal themes of Persian rule: respect for the gods of all peoples, just and peaceful rule, and the power and glory of the empire.